At risk of stating the obvious this nonetheless seems like a good time, as we’re now three months into rock’s lifetime here on Spontaneous Lunacy, to bring this rather pertinent fact up – Records are inanimate objects. A flat piece of black shellac, a color label in the center with the title and artist’s name to catch your eye maybe, but while it’s at rest there’s absolutely nothing really notable about it. Collectors would argue otherwise, and based on market value for such things they might prove their case, but broken down into raw materials a record unto itself worth virtually nothing. An mp3 – a digital file in the ether made up of 1’s and 0’s, an unintelligible code to all but computer programmers – doesn’t even have the plastic and paper to give you anything to melt down to make art with, or to fly it like a frisbee out your window if you have the notion. But then again, while sitting on a runway an airplane is technically an inanimate object as well. More flashy perhaps, certainly bigger and of much more value in terms of what its components cost if you stripped it down and sold it for parts, but essentially it’s a statue, an oversized paperweight, until somebody turns it on. What’s the point of those fascinating insights? Well, the point of this blog was to tell the full story of rock music from the very beginning, but in order to do so competently you really need to hear the music for yourself! Three paragraphs just to get back to the same line that opened this review – something about stating the obvious, I believe it was. That’s why when possible these reviews come with the songs embedded in them to hear, because as well as I hope I’m able to write about them, unless you hear what I’m writing about it’s just words on a screen, just as a plane in a hangar is simply taking up space and a record on a shelf is just collecting dust. You need to turn them on to be turned on by them and to get anything of value out of them. Spotify is free, so press play and enjoy it… and this is definitely one song you need to hear in order to fully grasp its charms. When the needle drops on Crown Prince Waterford’s record, Move Your Hand, Baby it is akin to an airplane turning on its engines and heading down the runway. It rumbles as it approaches, loud and relentless, speeding up until the roar is deafening as it takes off. Pete Johnson is piloting this plane from the piano bench. The legendary boogie woogie king who made his name a decade earlier backing Big Joe Turner and who since has bolstered his reputation through long engagements in New York and elsewhere, is now seeing the boogie woogie craze he helped launch in the late 1930’s give way to rock ‘n’ roll. Oddly enough, while his old running mate Turner recorded prolifically, with and without Johnson at his side, and was fairly successful doing so to this point, his peak as a star is still yet to come, though Big Joe doesn’t know that at the time. On the other hand as 1947 draws to a close Pete Johnson’s glory days are mostly behind him, though he too is blissfully unaware of that fate. 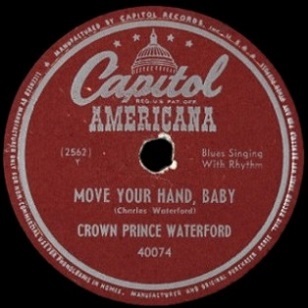 Yet on this day, backing Waterford in the studio for Capitol Records where Johnson has been employed as of late, and when listening to this record specifically, it would seem as though Pete Johnson and Crown Prince Waterford were both poised for superstardom. With this song they were at the controls of not just an airplane here, but one of those new fangled jets, the musical equivalent of the kind that pilot Chuck Yeager flew when he became the first to break the sound barrier just two months earlier. Unlike Yeager, who’d would continue to leave his mark in the annals of aeronautics for quite some time to come, neither Waterford or Johnson would really make it off the ground again. You’d never know it by this though. After the storming piano intro Waterford jumps in and reaches cruising altitude quickly, leaving no question what kind of wild ride you’re in for. The song is sexual in nature, but whereas most of this type are all about verbal foreplay, hinting at, alluding to and smirking about the particulars to get a rise out of the listener, Waterford seems intent on just satisfying himself. No sly winks and nods here, instead the clothes get torn off in a mad rush – her protests as she covers up her privates as he leeringly makes his move for her are certainly not about to dissuade him and by the sound of it she may be just putting up a respectable show of not wanting it anyway and is probably not going to resist for long – and so it’s a sure bet that the bed springs are in for a workout and the walls will be rattling soon. If the windows are open the neighbors won’t need to turn on the radio or television for their entertainment tonight, but by the sounds of it Waterford couldn’t care less – Your jellyroll is all I crave! – he cries. If there’s a weakness to be found it’s that Waterford’s voice is a little reedy for the material, at least compared to the dominant image of the performers these types of songs usually feature. Unlike most of the carnal hellcats in rock through the years, led by Wynonie Harris, the Crown Prince strains at times, his voice unable to resonate well enough to convey the swaggering lothario façade that is all but mandatory for that line of work. As a result he comes off more horny than virile, but his full-throttle approach is so contagious that you may not notice, or mind. It’s really Johnson’s show, no matter what the label says, as he roars along on the keys, swooping low and climbing high, performing barrel rolls in the barrelhouse, deftly filling in the cracks between lines and then taking off into the blue during the breaks. He plays with precision, yet seemingly complete abandon too, an absolute master at this style able to provide every listener with an aural shot of Viagra, an instant jolt of electricity each time he’s featured. But Waterford more than holds his own in such prestigious company. An exuberant, if fairly limited, singer with a somewhat extensive résumé in a wide range of styles, starting with playing jazz with Andy Kirk’s 12 Clouds Of Joy, blues with Jay McShann and much later, well after this in fact, he became a preacher and recorded gospel music. But where he excelled, even if it was only briefly, was in the uptempo rockin’ terrain shown here. The off-color lyrics were something of a specialty for him already at this point, having already released a paean to lesbianism on Girl Friend Blues and then delving into the truly salacious with Washboard Blues, which implies this one particular girl he’s rhapsodizing about enjoys her “rubbing” with both men AND women! Needless to say even if you aren’t a fan of the music attached to this kind of stuff the lyrics alone will have you listening with rapt attention until the… err… climax. It may be done without tact or subtly, certainly without discretion, but sometimes in the heat of the moment your carnal needs quickly overcome any puritan inhibitions and once they’re up to speed they could care less who might listening to their raunchy activities. If rock ‘n’ roll needed yet another calling card to announce its imminent takeover of the next musical generation Move Your Hand Baby would surely suffice in that regard. Already the music was staking its claim on the other side of the tracks, where the action takes place after dark in seedy locales and where names are exchanged less frequently than venereal diseases and then usually only under duress. The soundtrack for a world that provided a menagerie of cheap booze, strong weed, fast women and loose morals. Eventually, when rock ‘n’ roll attracted the attention of the mainstream, not to mention the vice squad, it’d be cleaned up by the gangsters of good taste and moral rectitude, but until then it existed for the cheap transient thrills of the disenfranchised. For anyone familiar with those earlier efforts on his part there surely was little doubt that Waterford would make the leap into the bosom of rock ‘n’ roll when it flashed its shapely figure in his vicinity and one thing’s for certain, on this record the guy and his girl will NOT be inanimate objects for long and when they climb into the cockpit and take off the sound barrier won’t be the only thing in risk of being broken and a good time will be had by all, listener included. Leave a reply on "Crown Prince Waterford: “Move Your Hand, Baby”"